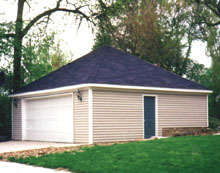 Hip garages are four sided, as opposed to the two-sided gable roof and are one of the most common type of garage for a variety of reasons. 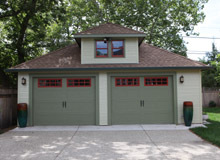 A hip garage may seem like the most basic and simple option, but with the right touches, it can be an extremely attractive addition to your home and property while still being affordable and functional. Steep slopes are advantageous in areas that have a lot of snow in the winter. 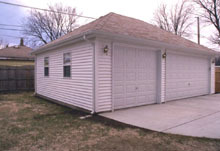 Therefore, hip garages are common in the Chicagoland area because we tend to receive a lot of snow. 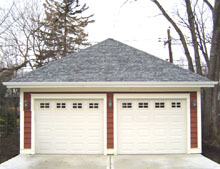 And hip garages are less vulnerable than gable garages to high wind. 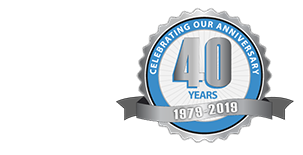 Looking for the Hip Garage of your dreams?